1 Spray large nonstick skillet with no-stick cooking spray and heat over medium-high heat. Add onion and cook over medium heat, stirring occasionally, until onion begins to soften and brown, about 5 minutes. Stir in kale and cook, stirring occasionally, until wilted, about 2 minutes. 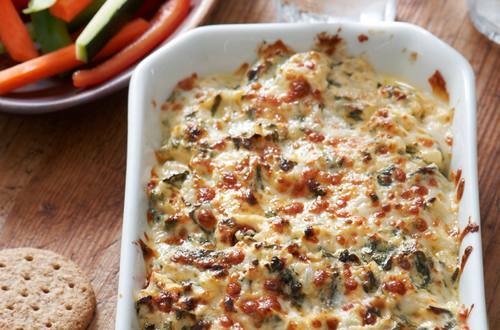 Stir in cream cheese, Hellmann's® or Best Foods® Organic Chipotle Mayonnaise, 4 tablespoons Asiago cheese and Worchestershire sauce and cook over low heat, stirring, until well blended. 2 Spray 1-quart baking dish with no-stick cooking spray, then spoon onion and kale mixture into dish. Sprinkle with remaining Asiago. 3 Broil dip until cheese browns and mixture is bubbling, about 3 minutes. Let stand 5 minutes before serving. Serve with cut up vegetables, sliced whole grain baguette and/or whole grain tortilla chips. Also Terrific with  Hellmann's® or Best Foods® Organic Original Mayonnaise.